The Fly, the 1986 body-horror classic that is arguably David Cronenberg’s crowning achievement in the subgenre, is in line for the remake treatment with Sleight writer-director J.D. Dillard. Per Deadline, Dillard has now officially opened talks with 20th Century Fox to shepherd the modern reimagining alongside long-time writing partner Alex Theurer. Fox is reportedly hoping that said reimagining will spawn something of a franchise revival, and it’s worth keeping in mind that George Langelaan’s original short story – the same one that inspired Kurt Neumann’s 1958 adaptation, and later Cronenberg’s horror masterclass – seeded the creation of two sequels: Return of the Fly and Curse of the Fly. The story goes that a scientist hellbent on breaking new ground in teleportation accidentally transforms himself into a grotesque, vomit-spewing human-fly hybrid. 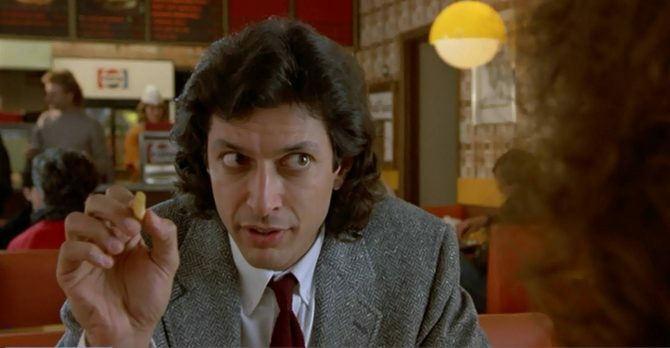 Jeff Goldblum delivered a memorable performance as the bizarre Seth Brundle back in ’86, when Cronenberg’s stomach-churning feature went on to land an Academy Award for Best Makeup. To this day, it remains the director’s only film to be awarded an Oscar. Geena Davis starred opposite Goldblum as the brilliant Veronica Quaife who, much like the audience, looked on in horror as Goldblum’s crackpot evolved (devolved?) into an unrecognizable monster. So, there you have it; after doing the rounds for years, The Fly may well take flight under the watchful eye of J.D. Dillard. Those negotiations are currently ongoing, so stay tuned for more. Sleight, meanwhile, will hope to cast a spell on moviegoers on April 7th. Another project on the horizon for the writer-director is Sweetheart, which stars Dope breakout Kiersey Clemons.